NOW HERE!!! Read the early reviews! Books are $30 CAD + shipping charges. If you have any questions, please let me know. Save the postage and join me at one of my book talks! Libraries, bookstores, government and businesses, send PURCHASE ORDER, PRICE QUOTE or REQUISITION to Marangi Editions/Angie Littlefield, 72 Baronial Court, Toronto, ON, M1C 3J7. Canada Postage or Fedex costs determined by weight. Please indicate: Canada Post or Fedex. Order your Tom Thomson holiday book set now! Dedication requests to angielittlefield@yahoo.ca or complete Dedication box. Part memoir, part 'secrets of the sculptor's craft', part celebration of Canadian culture and talent, Life and Bronze: A Sculptor's Journal is the story behind Ruth Abernethy's rich and varied artistic career. The author describes each of her sculpting projects, from opening discussion, to creation, to installation and public unveiling. This coffee table book shows what the public chooses to commemorate, how a sculptor resolves clear expressions of character, and how this process fits into a full family life. 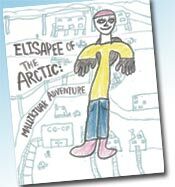 A new heroine is born, Elisapee of the Arctic! This charming tale of identity, created by Inuit youth Arn Pootoogook, Joanne Weedmark and Stephanie Weedmark of Cape Dorset with Angie Littlefield of Toronto, blends the present and the past and brings a beautiful part of the world to all audiences. Download free pdf copy, just click on book cover. "Revised 2nd Edition now in print"
Tom Thomson (1877–1917) created some of Canada’s most recognizable art from sketches made in Algonquin Park 1912–1917. His association with Ontario’s north is well known. Tom Thomson’s 12 years in Toronto are less known. The Comet of Cologne Dada. Catalogue ed. by Catherine de Zegher. Toronto/Cologne 2009/10. Beitr. von Angelika Littlefield, Dorothy Rowe & Sabine T. Kriebel. 128 S. mit 154 meist farb. Abb., Ausst'verz., Bibliographie, Chronologie, brosch. Nur wenige Arbeiten der schon mit 23 Jahren verstorbenen Malerin und Frau des Kölner Dadaisten und Mitglied der Kölner Progressiven Heinrich Hoerle sind überliefert. Selbst Max Ernst hat ihre phantastischen Konfigurationen geschätzt. Seit fast 60 Jahren ist siedie geheimnisvolle Unbekannte. Die Autoren haben nun mit Hilfe des Museum Ludwig Köln sämtliche Fakten zusammengetragen und die Arbeiten kunsthistorisch würdigen können. Angelika Hoerle (1899-1923) and her artist husband Heinrich Hoerle were key figures in the Dada movement in Cologne, and she created an outstanding body of work - now almost entirely housed at the AGO - from 1919 until her untimely death in 1923. The catalogue will explore how her art fit into the artistic and political movements inWeimar, Germany. later, Kathleen has translated this story. Fritz is able to find consolation in the beauty of life and creation. He never expresses hatred towards his captors. Rather, he endeavours to understand both the Soviet system and his Soviet captors and strives to maintain a critical and objective perspective on them and their character, a position that enables him to maintain a healthy mental outlook. “Dr. Michael Lee Zwiers, psychologist, Canada. His website has more links to explore and some interesting essays. Published by Perdida Press in Thunder Bay in 2007, is an inside story based on the papers Robert Lavack had from his days with Norval Morrisseau and the art circuit. It also contains Lavack's reminiscences of the time. The book provides key evidence about the early life and career of Norval Morrisseau. Click here to read more on-line about Robert Lavack. In a career spanning five decades, Norval Morrisseau has figured prominently among artists in Canada. He has created a unique style of painting to convey his knowledge of and his deep pride in his Anishnaabe culture; his work both parallels and propels the development of Aboriginal art in this country. The catalogue documents the nearly sixty works in the exhibition which reflect and elaborate on the spiritual aspects of Morrisseau's art. My daughter Jennifer and I wrote The Ten Deadliest Plants for Rubicon. They’re a lot of fun! They’re available from Scholastic Canada at www.scholastic.ca/education/the_ten/index.html There’s a whole series of these very educational books. My daughter Jennifer and I wrote The Ten Grossest Bugs for Rubicon. They’re a lot of fun! They’re available from Scholastic Canada at www.scholastic.ca/education/the_ten/index.html There’s a whole series of these very educational books. Dr. Gerd Gruber's Aufbruch in die Moderne, 17.90 Euro + postage.